Who are The Viking Bunnies? What is going on here? 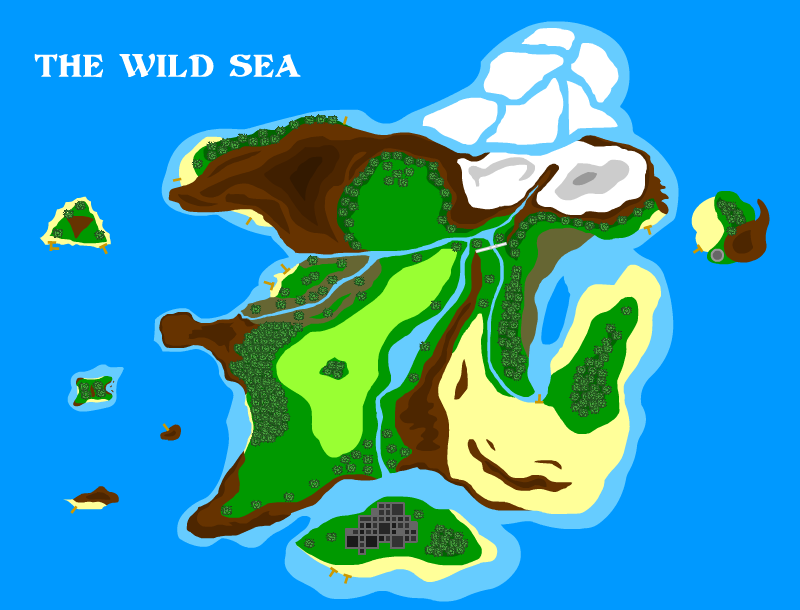 The world of The Wild Sea is divided, leaving the various animal tribes locked into what has become known as The Animal Kingdoms. The Pirate Pigs have conquered Bacon Bay. The Miner Moles live in Mount Molehill. The King Crabs and The Ninja Hamsters have staked claim to Tidewater Island and Woodshavings Island respectively. The Party Penguins have taken the frozen north and the Medieval Chickens have roosted in their own valley. Leave it to four Farm Bunnies to mess the whole thing up, cross into the other kingdoms, and stir up mischief. Not wanting to simply be a boring Farm Bunny and work the land, a little bunny named Fuzzy conspired with his friends Steve and Lars to become something more. Fuzzy longed for treasures and to become a legend. Lars was a top-notch athlete and also found the farm life dull. Steve had eaten enough carrots and lettuce to bore him to death and he longed for more tasty snacks. Thankfully they all knew a very smart bunny named Thora who had also diverged from the Farm Bunny path for she longed to explore and learn all she could about science and the natural world. Realizing they had no desire to stay, the four of them built a boat and planned to leave their safe pasture, believing themselves to be destined for something more. Declaring himself captain despite Thora being the one who actually built what they now called The Bunny Ship, Fuzzy decided that the tile of Farm Bunnies was not going to work any longer. Without taking a vote for he was now Captain Fuzzy, these four bunnies became The Viking Bunnies. Together, Steve, Lars, Thora, and Captain Fuzzy set out for treasure, adventure, discoveries, and delicacies, each bunny seeking their own prize out on The Wild Sea. Hardly able to get along, yet each beneficial to the team in their own right, The Viking Bunnies quickly realized that not all the animals outside of their safe village were going to be friendly. Sure, The King Crabs were very friendly and The Miner Moles were a very peaceful race, but The Pirate Pigs and The Ninja Hamsters? Maybe The Viking Bunnies were not ready for all the adventures they would discover. Stirring up trouble wherever they went, it didn't take long for word of The Viking Bunnies to reach the ears of the lord of The Wild Sea, the wicked and ruthless King Hamondorf: Rules of The Pirate Pigs. The Viking Bunnies should probably keep both ears up and both eyes on the horizon. Yet still seeking their treasures, their adventure, their discoveries, and their delicacies, The Viking Bunnies would still sail onward, ready for anything that might come their way as they sought to become something more: legends. Originally created in 2010 by me, Noah B. Wilson, The Viking Bunnies started as a simple kids book series with the intent on being something colorful and fun that parents could read with their young kids. There was parody and silliness for adults while also being totally friendly and safe for young kids. There was some early artwork and four completed stories, and there was even an agent who represented them for a time, but nothing came from the kids books and The Viking Bunnies didn't get very far. Not to be stopped, The Viking Bunnies have now been rebooted here in 2018 because they are just too cool to be ignored. Their adventures and their world remain from the first books, but now their maturity levels have risen and they have moved from books to cartoons (because I guess people don't read anymore). Adopting a new animation style, and getting a mobile game to go along with their cartoons, The Viking Bunnies are ready to return in a whole new way, hoping to work their way onto the internet, and hopefully on to something beyond that! The Viking Bunnies are here to stay, and their new adventures will be taking off in in 2018 with 8 cartoons already planned out (and surely a lot more to come about as time goes on). There's no company backing The Viking Bunnies. There's no budget outside of my wallet and your support. We here do all the animation, voices, writing, music, and programming. We don't owe anyone anything but the fans who support us. The Viking Bunnies are for the people, and I can only hope that the people enjoy them.